For the past 10 days have passed since the start of large-scale action, carried out by watch brand Seiko. Beginning from July 1, 2012 event, held among the retailers of the famous Japanese watch brand producing watches. Implementation of the shares held by partnerships Seiko and FC Barcelona. The action is focused exclusively on the retail sale of products Seiko and carried out only in authorized stores. During her of any purchased watches Seiko «bring” his trademark backpack buyer Seiko, and the buyer becomes a party to the main draw of the prizes. As the main prize the company is one of three trips for two to Spain, FC “Barcelona” in their own stadium. 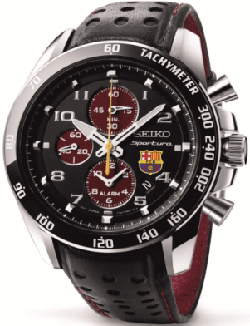 The second prize of the company – 20 sports chronograph Seiko. Fcb promotion, which provides detailed information with description and rules of action. The action is carried out from 1 July to 31 August 2012 inclusive.